A modern hurried world has been literally flooded with luxury cars. A man before buying a car doesn't even know which producer of cars is better. He can choose the most possible luxury or prefer a big power output packed into the high category. Or he can prefer the third alternative - to choose both: luxury and big output. Of course, it doesn't mean that he will buy 2 cars but vice versa. He will choose the car with everything. This means a big output, flexibility and a considerable touch of luxury. This is exactly how could be the latest model of Volkswagen Car Company described. We are talking about the car labeled Volkswagen Jetta. As it is used to be by other innovations, also in the case of Volkswagen Jetta there was no need to wait for a long time and a tuning company started to modify it. A company which among others deals with modification of Volkswagens was far the best choice. We are talking about the Belgian company Caractere and about their new finding, Volkswagen Jetta. Let us look together, what they have created. Volkswagen Jetta was presented in public for the first time as early as in 1979. It was a model based on the revolutionary Volkswagen Golf and it was designed first of all for more conservative people. 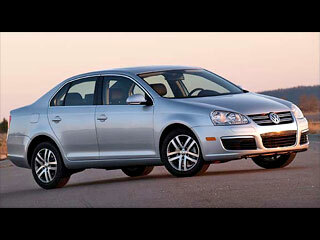 The biggest number of Volkswagen Jetta was produced overseas, in USA, where this car became very popular. Therefore 6,6 million cars wasn't produced for nothing. After 26 years Jetta is back again, but now in the latter and smarter design. This luxury sedan was presented sometimes in the middle of the last year as an expectation of something which will joint Volkswagen Golf and Volkswagen Passat in it. An expectation turned into reality and it is up to everybody to make own point of view about this car. In spite of that, we must say that this car involves components of sporting design, dynamics and luxury. And these are exactly the features which are required from a modern compact car. Volkswagen Jetta was presented as a sedan and introduced in three degrees of equipment: Trendline, Comfortline and Sportline. 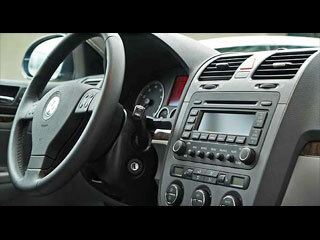 The engine offer is very rich in the case of Volkswagen. The most powerful out of seven gasoline engines is four-cylinder TSI turbo with output of 200 horsepower (147kw). Four-cylinder TDI with output of 140 horsepower (103kw) dominates between diesels. As far as the most powerful gasoline engine is concerned it will be provided with 6-speed manual transmission with overdrive or automatic transmission with overdrive. Although the offer itself is not wide, the offered engine power output is very impressive and everybody will surely choose something. You have certainly noticed the abbreviation TSI. It is a new technology, which guarantees maximum engine output at minimum fuel consumption and this is done by creating a "working harmony" between turbocharger and supercharger. As far as the equipment is concerned, the new Volkswagen Jetta doesn't lag behind in any way and it offers a wide range of supplementary equipment as for example front halogen or bi-xenon headlamps, DRL (Daytime Running Lights), black tinted rear glass, front sport seats, three-spoke leather-wrapped multi-function steering wheel + multifunction computer. Other interesting components of the equipment are dual-zone automatic climate control, radio navigation system, 10 speakers, colored LCD display etc. We have already got used to the fact that Caractere Company can wring maximum out of any car. This means that this company can make a real beast of prey from a luxury car, but at the same time the elements which make a car luxury remain untouched. This is exactly what has happened to this model of Volkswagen Jetta. The modification of the car continued further with side skirts. They were made with a touch of aggression but at the same time they were chosen with emotion. In the rear part of the skirts are the openings filled with the black metal, which allow cold air flow into the rear break disc system. These side skirts go very well with the fluent curves of the whole car and they emphasize its stylish and dynamic character. As far as the rear part of the car is concerned, it has also been modified, but in the more retiring way. A bottom opening of the rear bumper which was modified is lacquered black and on its left side is a gap for the exhaust endings. It is nothing great, but enough stylish to emphasize the specialty of this car. The modification is also supplemented by the rear wings. Caractere Company also offers two types of spoilers: Boot spoiler as a slight band at the end of the rear trunk or Sport spoiler. Sport spoiler has a considerable sporting touch, but for this Jetta it is never enough. What is more, the roof spoiler above the rear glass makes the roof optically longer. By this last approach company came to the end of its long way of "tuning adventure" on this exceptional car. 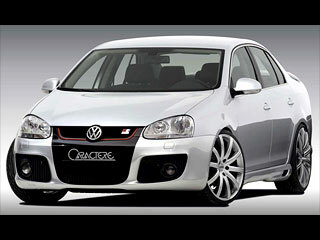 Do you like this Volkswagen Jetta tuning by Caractere?